Settlements too noisy? 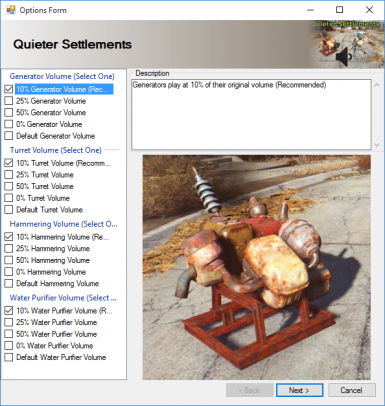 This mod reduces the volume of generators, turrets, and other settlement sounds. Choose different volumes for different sounds. Tired of the noise in your settlements? Generators and turrets too loud? A settler won't stop hammering the same broken fan? Quiet them down! 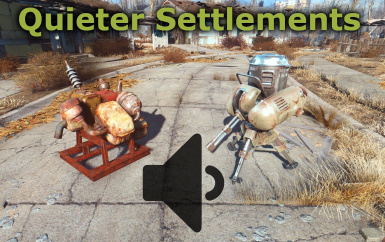 Quieter Settlements reduces the volume of generators, turrets, and other settlement sounds. Choose different volumes for different sounds. Most sounds have the following volume options: Original, 50%, 25%, 10% (Recommended), Silent. "Version 0.30 has been revamped by converting the mod as a Fallout 4 plugin (.esp) and is now quicker and easier to update than the previous method, but most importantly, reduces the file size dramatically. It has been made using only Creation Kit and should allow compatibility for Console players. MO2 installation issues should be resolved at this time, though there have been reports in the past of the installer freezing during the installation process. Setting the Fomod Installer plugin to "Prefer: False" under the "Settings > Tools" section for the duration of the install has been reported to work around this issue. You can return the setting to "True" after the installation. Thank you to Destynova99 for identifying and resolving this issue. Special thank you to CAPGames for updating this for the Wasteland Workshop DLC and the Contraptions DLC in my absence. All credits to him for adding in the Wasteland Workshop DLC and Contraptions DLC audio files for me and updating the NMM installer. At present, I am focusing heavily on my academics. Though I can still be reached, CAPGames is happy to update this mod in my absence. If there are any suggestions for updates to Quieter Settlements please message him on NexusMods.com. This mod was made by producing different volume versions of the relevant .xwm and .wav sound files. FO4snip was not used. I do not create compatibility patches for other mods for two reasons: One, it takes a surprisingly large amount of time to add a sound to this mod, and two, if a mod uses a custom sound, that sound is not my property to modify and re-release. If a mod author wishes to work with me on a compatibility patch for this mod, I am open to speaking with them.